ANDRE BERTO: "I'M FOCUSED ON GETTING THIS REMATCH WITH ORTIZ"
"I think they are already working on something, so I will be back as soon as possible. I just want to get back in there and make it happen. Everybody who watched the fight says the same thing; I didn't perform like I usually perform and up to my ability. At the end of the day, whether I won or not, it still ended up being an exciting fight and maybe one of the Fights of the Year and I believe people will be looking forward to see how I come back from this adversity...They are gonna see more. I feel hungry and focused and mainly, I was just disappointed in myself for letting a lot of things get to me and affect me and it affected my performance. But I live and I learn and they are gonna see me come back a lot stronger and a lot better...as soon as possible, we will be back in the ring. I'm focused on getting this rematch with Ortiz; we're going to try to stay in the running with that as well. I'm looking forward to things that are coming in the future," stated former welterweight champion Andre Berto, who talked about his eagerness to get back in the ring and get his title back. 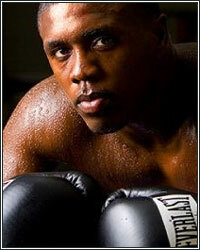 Check out what else he had to say about Victor Ortiz, Floyd Mayweather, and much more. PC: How have you dealt with your first loss as a professional my man? AB: Well, you know I just got back in the country, man. I had to take some time to basically just get away for a minute. I know I have a lot of critics before the loss and after the loss, but the thing a lot of people don't know is I'm my biggest critic, so I'm disappointed in the way that I performed and I'm disappointed with the way that I went into the fight not completely focused and where I was supposed to be. I take it the hardest and I just had to get away and get a little time off. So I left the country for a couple of weeks and I'm just getting back. I'm feeling good and refreshed and I'm just ready to get back in. PC: You said you weren't where you were supposed to be going into that fight. We've seen you in tough fights where you didn't mentally break, but on the flip side, we had seen Ortiz break in some of his tougher fights. Did you approach that fight thinking at some point, you would break him? AB: No, it was just...everybody who watched the fight, they could see it on my face when I was walking to the ring that something just wasn't right. Leading up to the fight and before the fight, there were a few things behind the scenes that had me a little rattled and kind of took my mind away from the fight. Of course I didn't want it to show, but it did. At the end of the day man, no excuses. Victor Ortiz came ready to fight. I didn't do what I had to do and he came out with the win. It's plain and simple. It's a matter of getting back to where I need to be and coming back and taking what's mine. AB: (Cutting in) I think a lot of people took it the wrong way. They took it out of context. Ortiz did his thing. He came to fight and he was the better man that night, plain and simple. Just like we took all of the wins in my career, we will take the L like a champ and keep it moving. PC: Now that you are back in the country, how long will it be before you go to your team and get them working on your next bout? AB: You know, I think they are already working on something, so I will be back as soon as possible. I just want to get back in there and make it happen. Everybody who watched the fight says the same thing; I didn't perform like I usually perform and up to my ability. At the end of the day, whether I won or not, it still ended up being an exciting fight and maybe one of the Fights of the Year and I believe people will be looking forward to see how I come back from this adversity. PC: You suffered your first loss as a pro and so did Devon Alexander and Chad Dawson. I think people were a little underwhelmed at the way Chad performed in his comeback fight. You are always explosive and exciting. Can fans expect much of the same or will you now take a different approach? AB: Nah, they don't need to expect anything less. They are gonna see more. I feel hungry and focused and mainly, I was just disappointed in myself for letting a lot of things get to me and affect me and it affected my performance. But I live and I learn and they are gonna see me come back a lot stronger and a lot better. PC: There were talks, awhile back, about maybe you and Alexander or Bradley meeting at a catchweight. Are you strictly a 147-pounder or are you willing to bend a little to make some of these other fights happen? AB: Hey man, I'm a 147-pounder, but at this point, I can't say what the future holds. Like I said, I've been out of the loop for a couple of weeks and I'm just getting back, so whatever my promoter lines up for me, I'll be ready to go full steam ahead. The boxing game is like this, man, you can be down one day and then have a spectacular performance in your next fight and be back in the running and be the person everyone is talking about. I'm not going to worry too much about it. I'm just going to get back to work and stay focused. PC: There were a lot of rumors going around that Floyd Mayweather Jr. was at the fight to scout you for a possible fight. Is there any truth to that rumor? AB: I don't know, man. It seemed like a lot of people showed up for that fight. I don't know if he was scouting me or not, but if he was, he probably was disappointed in my performance like I was. But at the same time, Floyd has watched me fight plenty of times and he's watched me train, so he knows what I'm capable of and he knows it wasn't me that night as well. He actually called me like a week after the fight just to speak about the situation. He knew something was wrong, so he just wanted to speak to me about it. But yeah, I'm not sure, man, why he was there. But I'm just going to get back to doing what I know how to do. PC: I don't think people understand how much time and work you put over in Haiti and that's something that goes missing sometimes. Is the situation looking up over there at all? AB: Well, we just continue to handle the charity aspect over there. They just elected a new president, so hopefully we can work with him as well and get support from him to uplift the country. But even though it's not front page of the news anymore, they are still going through the struggle. Some things have gotten better, but there is still so much that needs to be done. We're just going to continue to work in and outside of the ring and try to bring a lot more light on that aspect of things going on over there for sure. PC: I get a lot of emails and a lot of people feel like now is the time to make the Mosley fight, which was scheduled to take place before the Haiti earthquake. Is that a fight that you think can be salvaged or do you think his performance against Pacquiao pretty much scrapped it? AB: Yeah, I'm not sure man. His last performance was kind of tough. I don't know if I would feel good for myself because Shane Mosley is a tremendous fighter and a future Hall of Famer and I don't want him to continue to try to do things that his body probably won't respond to. I got too much respect for him to probably try to take that route. But it looks like, as soon as possible, we will be back in the ring. I'm focused on getting this rematch with Ortiz; we're going to try to stay in the running with that as well. I'm looking forward to things that are coming in the future. PC: It's good to have you back on the site. I can't wait to see your next fight and best of luck. I'm sure you've had a great support system helping you get through this. Give your shout outs my man. AB: Yeah, I appreciate it man. I've had a tremendous amount of support since the fight and I've been getting a lot of emails and tweets from the fans, man, and it's been incredible. I know they realize they didn't see the real Andre Berto that night, but they look forward to seeing me back. We're going to come back and take what's ours and get back on top like we never left, so it's going to be all good.